Reliance Jio has recently announced the Jio Prime membership plan to its users wherein users have to pay Rs 99 as a one-time fee to get Jio Prime. The Jio Prime users will have access to the bouquet of features to access and unlimited calling and data plans along with the free Jio Apps subscription. 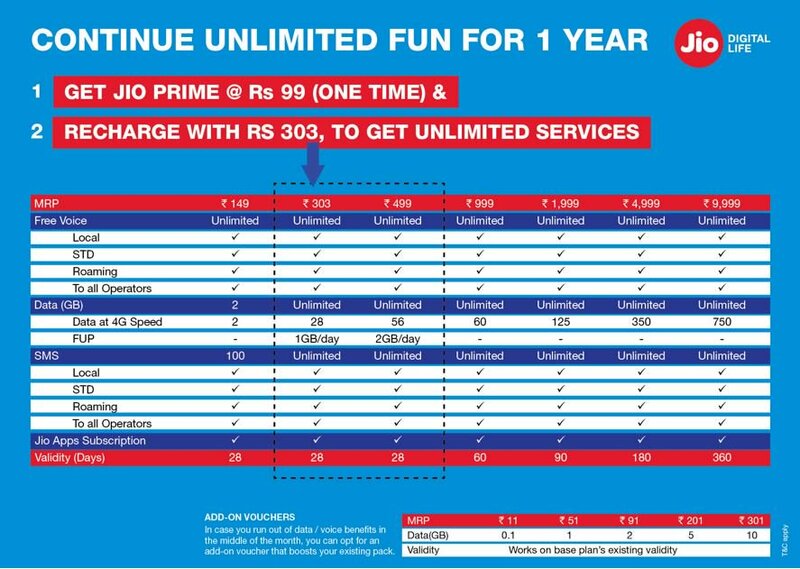 Here are the new tariff plans announced by Reliance Jio to its Prime customers. Along with the Rs 303 plan announced by Mukesh Ambani at the meeting held last week, Jio has also revised the existing plans to offer more data for few plans and unlimited data on other plans. All the add-on vouchers work on base plan's existing validity.